Cangiano's Clarks Summit is now CLOSED. Cangiano's is among my favorite places to grab a hoagie in Clarks Summit. I routinely grab "the cangiano" once every couple of weeks and enjoy it every time. 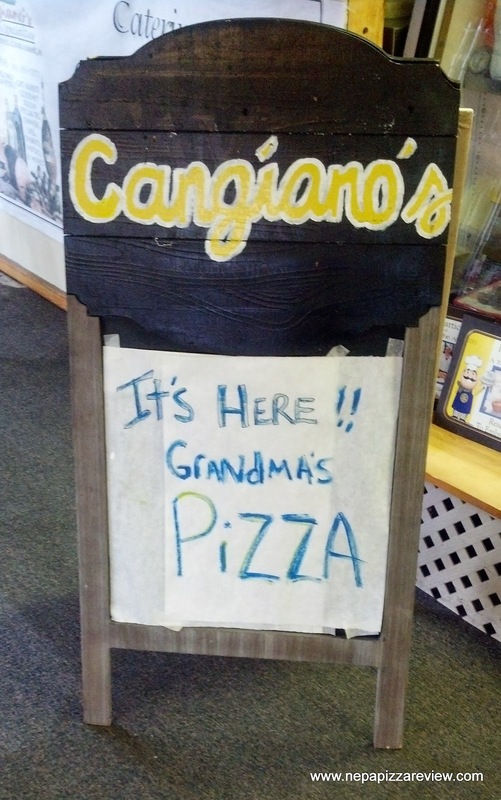 I was in one day grabbing my sub with the flaky crunchy bread, when I noticed a sign that said that "grandma's pizza is here." I quickly asked the lady behind the counter if they were selling pizza, and just as quickly realized that was an idiotic question because the sign said they now had pizza! She was very friendly as usual and said that it was quite popular and they have sold out of it recently. 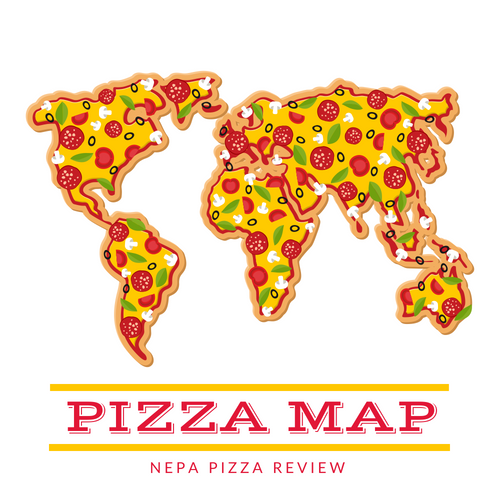 I made a mental note that I would be returning very soon to alert the folks of NEPA that there was a new pizza on the scene and sure enough, within a week, I placed my order and took it over to a friends house where we were gathering to watch some football. After opening up the box to photograph it, I determined that this pizza was quite beautiful to look at with its deep reds, dark browns, and other lovely contrasting colors. I enjoyed the steam rising from the pie and the fact that they did a nice job putting it together. I liked that the crust was imperfect and had rounded corners - this meant that they are using dough, rather than a premade crust. My mouth started to salivate, as two of my buddies also noted how good the pizza looked. I grabbed my first slice, and prepared to review with a little help from my friends who also tried it out. We all crunched down with anticipation, and the room suddenly went silent. I was a little bewildered by what I was tasting, and what I tasted was next to nothing. The pizza which looked so amazing, suddenly tasted so bland in my mouth. I was really rooting for this pizza to be great because I like Cangiano's and I thought this pizza looked amazing. I took another bite hoping that the first was a fluke, and unfortunately it wasn't. The flavors were all muted and nothing really stuck out. The dough was flavorless, and seemed like the mass produced frozen dough that my fellow bloggers Keystone Pizza Critic and Pizza Quixote write about frequently. I can't be sure, but the super uniform air pockets and the chewy consistency lead me to believe this is the case. The sauce added a hint of flavor, but not a ton. On top of the sauce was a layer of sliced onions, which were not well received by our group as they made the pizza difficult to eat because we kept pulling them out like spaghetti. I personally prefer chopped onions if used like this as the provide better texture and flavor. The cheese on top was probably the best part because it was beautifully browned and as I said earlier - it just looked amazing. Overall I have to say that the appearance of this pizza scored a perfect 10, and I also have to say that this thing was prepared as perfectly as it could have been. I also note that this thing was cooked properly, but to us the ingredients were the reason we weren't impressed. Many people aren't fans of onions, so it should be noted that was an automatic strike in at least one of my friend's eyes. I do believe that this pizza does have a ton of potential if a different fresh dough is used, a little more oil in the pan, chopped onions rather than sliced, and possibly a sharper cheese on top. The person making the pizza clearly knows what he or she is doing, I just think the ingredients need a little tinkering. 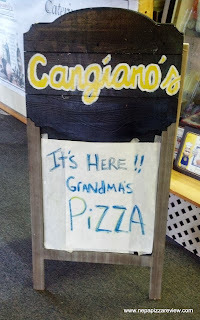 Starting a pizzeria is difficult to do, but I wish Cangiano's the best of luck in their pizza project, and I'll be back soon to get my usual hoagie! I recommend the hoagies, but please try the pizza and leave a comment below to let me know what your thoughts are.